Meigs senior Weston Baer (20) dribbles near the top of the key, during the Division III sectional final on Feb. 22 in Jackson, Ohio. 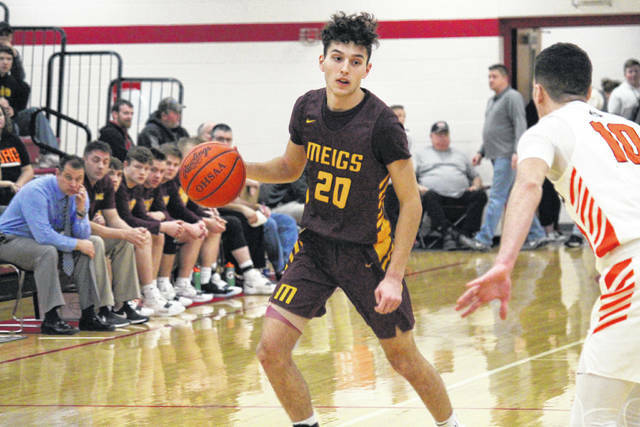 COLUMBUS, Ohio — The Ohio Prep Sportswriters Association has released the Division III All-Ohio boys basketball teams, featuring Meigs sophomore Weston Baer. Baer — a 6-foot-2 guard and career 1,000-point scorer — was named to the special mention portion of the All-Ohio list, moving up from honorable mention a year ago. Baer averaged 19.8 points per game to lead the 13-11 Marauders this season. The Division III Player of the Year award went to Canal Winchester Harvest Prep junior Christopher Anthony, while the Coach of the Year award went to Joe Frank of Archbold.